"...the whole recording is demonstration class-brilliant without sounding too close up. So is the conducting. Recordings of Massenet orchestral music are rare enough. Recordings this good are almost too much to expect. Grab it!" - American Record Guide, Jan./Feb. 1989. This record is on HP's list. 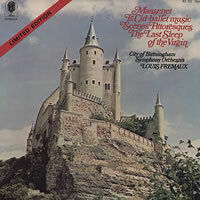 Side A: "Massenet: Le Cid Ballet Music" Side B: "Massenet: Scenes Pittoresques," "Offenbach: La Belle Helene," "Massenet: The Last Sleep Of The Virgin," "Berlioz: The Dance Of The Sylphs," "Berlioz: Minuet Of The Will-O-The-Wisps"